In life, it is becoming more and more popular to use GPS positioning. As for arduino MCU DIY experiments, is there a GPS positioning shield that can be compatible with the Arduino MCU? Well, use this keyestudio GPS shield. 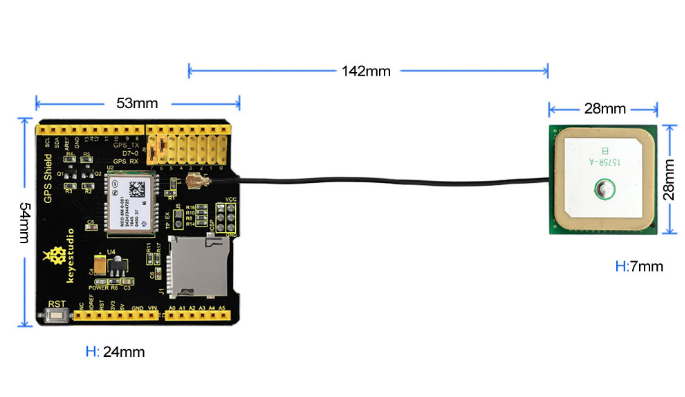 It is based on the NEO-6M-0-001 module, and those pins are also compatible with UNO R3 and MEGA 2560 control board. Regular GPS pins (RX, TX) is connected to Arduino D0-D7, and you are able to set the connection pin via the jumper cap. 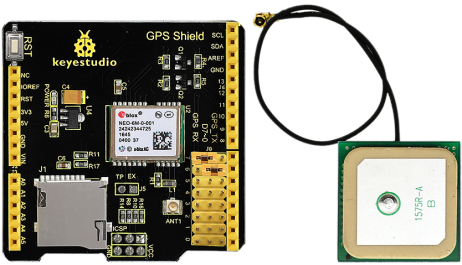 An active antenna is mounted on the GPS shield, allowing you to find your exact location within a few meters. Meanwhile, GPS also provides you with very accurate time! It can be used in car navigation, personal positioning, fleet management, navigation and navigation. 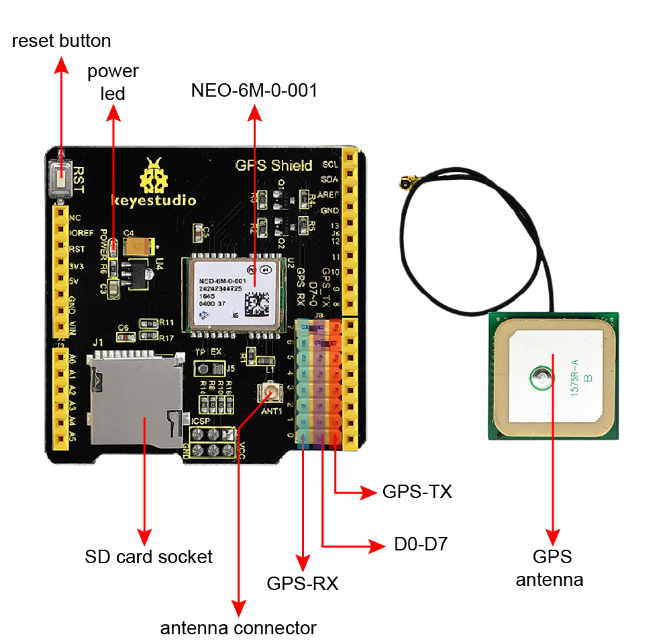 In particular, this expansion board can only be positioned outdoors and cannot be used for indoor positioning. 2.Connecting TxD and RxD to Arduino pins (D0-D8 optional) with jumper, and the default jumper caps are D7<-->RX and D6<-->TX. Below is an example code. Click here to download the code. Or you can directly copy and paste the code below to Arduino IDE. 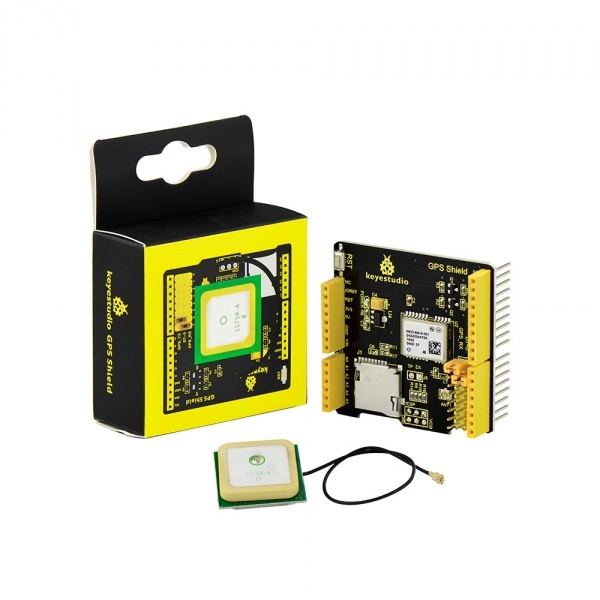 1) Upload the test code to keyestudio UNO R3 board. 2) Connect the jumpers on the shield, connect GPS_RX to D7, GPS_TX to D6, insert the SD card and plug in the antenna. 3) Stack the shield onto UNO R3 board. then connect them to computer using a USB cable. If you are indoor, please move the board outside. 4) Open the serial monitor, and set the baud rate to 9600, wait for a moment, displaying as the figure 1 shown.